Ogbonnia "Obo" Okoronkwo (born April 24, 1995) is an American football outside linebacker for the Los Angeles Rams of the National Football League (NFL). He played college football at Oklahoma. Ogbonnia was born in Gainesville, Florida. He is of Nigerian descent. As a junior in 2016, Okoronkwo had 71 tackles, 12 tackles for loss, and nine sacks. As a senior in 2017, he won the Big 12 Defensive Player of the Year and was named an All-American while recording 75 tackles, 17 tackles for loss, and eight sacks. Okoronkwo was drafted by the Los Angeles Rams in the fifth round (160th overall) in the 2018 NFL Draft. He was placed on the physically unable to perform list to start the 2018 season due to foot surgery he had in May. He was activated off PUP on November 5, 2018. ^ "Nigeria dominates Africa's 2018 NFL draftee list". ESPN. April 23, 2018. Retrieved May 7, 2018. ^ Stavenhagen, Cody (September 13, 2017). "OU football: Why NFL analysts are taking notice of Ogbonnia Okoronkwo". Tulsa World. Retrieved April 17, 2018. ^ Palmateer, Tyler (November 30, 2017). "Four OU players earn Big 12 honors, six make all-conference first team". The Norman Transcript. Retrieved April 17, 2018. ^ Daniel, Cody (December 8, 2017). 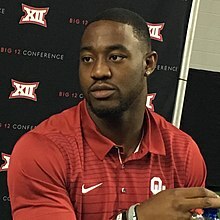 "Ogbonnia Okoronkwo honored as AP Big 12 Defensive Player of the Year". Springfield News-Sun. Retrieved April 17, 2018. ^ "Los Angeles Rams trade up to #160, select Oklahoma EDGE Ogbonnia Okoronkwo". TurfShowTimes.com. April 28, 2018. Retrieved June 10, 2018. ^ "Rams rookie Ogbonnia Okoronkwo likely to start season on PUP list". Rams Wire. USA Today. August 27, 2018. ^ "Rams Make Final Round of Cuts". TheRams.com. September 1, 2018. ^ Simmons, Myles (November 5, 2018). "Rams Activate Okoronkwo to Active Roster". TheRams.com.